Lava is pre-heated to 800 Celsius º and reduced into powder to be crafted thereafter into a beautiful lava jewelley line. attractive and modern pendants and necklaces crafted as striking abstract figures as well as animal or sea related figures. When Lava is cooled and hardened, individual pieces can differ in colour which ultimately gives an animated and dramatic effect. 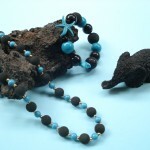 Our items are mostly made of black and grey Lava Stone. Error: Error validating access token: Session has expired on Tuesday, 15-Jan-19 07:09:03 PST. The current time is Monday, 22-Apr-19 18:03:46 PDT.